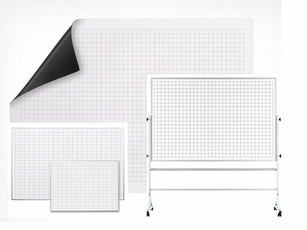 OptiMA dry erase grid options. 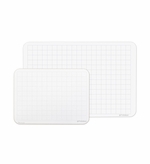 There might not be a more versatile design for a whiteboard than the grid. You can simply do so many things with a grid. Now add a dry erase writing surface on top of that grid and the ideas and possibilities are almost endless. 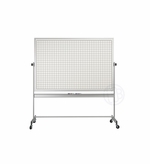 Our OptiMA dry erase grid board can be used to organize information, chart and graph data, design floor-plans and much more. That said, we have a number of design options available including wall mounted, framed dry erase grid boards with a magnetic receptive writing surface. The wall mounted units are available with another cool option, variegated rows or columns where every other row or column is slightly shaded vs. solid white making it so much easier to read and follow information trails entered into one of the boxes on the board. Our 4' x 6' free-standing dry erase grid boards are fully reversible and fully portable with a beautiful magnetic dry erase writing surface and one of the most sturdy frames in the industry. Four large, free spinning wheels and two with locking mechanisms to keep the board firmly locked in place. 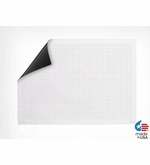 These are the perfect portable dry erase grid boards available to go where ever a standard wall mounted board just can't work like maybe out on the shop floor or in the middle of the training or conference room. Another OptiMA product that has made a huge splash are our magnetic roll up dry erase grid prints. Wow! 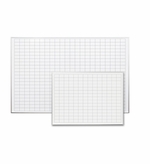 30" x 42" magnetic sheets with your choice of three different dry erase grid options; 1" x 1", 1" x 2" and a larger 2" x 3". This is the perfect tool when you don't need a grid board all the time but only for special projects or meetings and presentations. They also allow you to take your ideas or presentation from room to room in a snap! There are other options and kits available as well and of course every one of them can easily be customized to meet your needs. We are the factory so just let us know what you need and we will work with you for a solution. All products made in the U.S.A.
4' x 6' Free standing gridded magnetic boards that are fully reversible. Portable grid boards on casters move from room to room. From "Grid Options" "406A-1: 1\" x 1\" Grid on 1 Side (+$885.00)" "406A-2: 1\" x 1\" Grid on 2 Sides (+$925.00)" "" "406B-1: 1\" x 2\" Grid on 1 Side (+$885.00)" "406B-2: 1\" x 2\" Grid on 2 Sides (+$925.00)" "" "406C-1: 2\" x 2\" Grid on 1 Side (+$885.00)" "406C-2: 2\" x 2\" Grid on 2 Sides (+$925.00)" "" "406D-1: 2\" x 3\" Grid on 1 Side (+$885.00)" "406D-2: 2\" x 3\" Grid on 2 Sides (+$925.00)"
30" x 45.25" Roll up dry erase grid magnetic sheets sticks securely to smooth steel surfaces. From "Sizes" "DS: 9\" x 12\" Double Sided (+$3.95)" "LG: 12\" x 18\" Double Sided (+$9.95)"